Hello, Erica on the blog today with my first post for June. I have two cards for you today too! A friend of mine is going through some tough stuff at the moment and I wanted to make a couple of encouraging cards to send to her to let her know I'm always here for her, no matter how far away I am in actual distance. 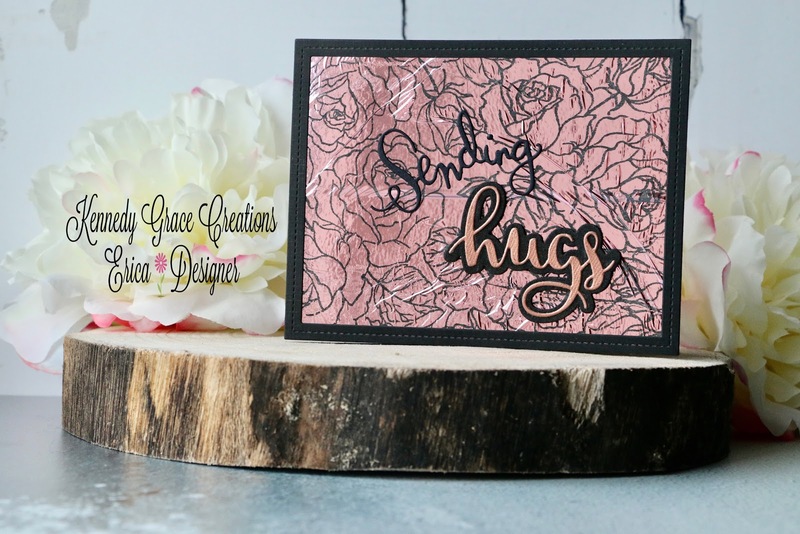 I decided to make a big background using the Splendid Roses stamp set and all my pre-cut masks came in so handy for this. My panel was slightly larger than an A2 size and I used my MISTI to make sure the stamped images were nice and solid as I planned to scan it, print if off and then foil it using my Minc machine. 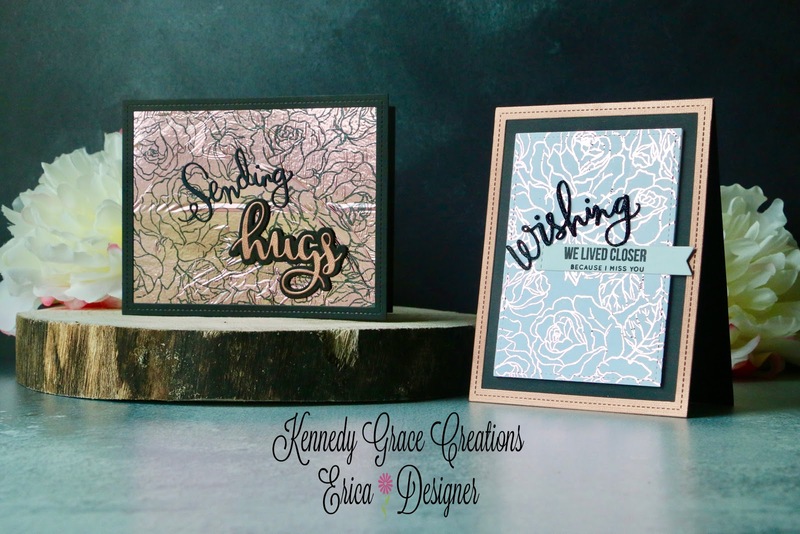 Once I was happy with the pattern I did just that and chose Pink Minc foil on it. The negative was so pretty I decided to keep that and use it on another card (this is how the second card in this post came to be.) The foiled piece I die cut using a Lawn Fawn stitched rectangle die and then again in foam to add some height to it. 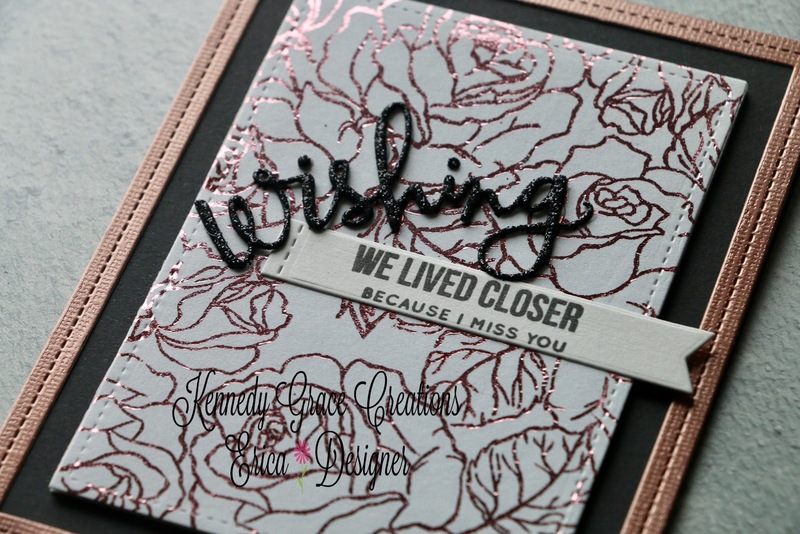 When it came to sentiment I used the 'Wishing' coordinating stamp and die set from Simon Says Stamp and die cut the word 'Wishing' out of black glitter foam, then I stamped 'we lived closer because I miss you' on a small white banner. I couldn't have come up with a better sentiment myself if I had used my own words. It says just what I wanted it to say. I cut a card base out of black card stock and added my foiled panel to the middle. It looked a bit naked so I cut a stitched frame (also Lawn Fawn) out of rose gold metallic card stock to frame it. That was it for the first card. The second card was a bit of a 'oh, this is so pretty, I can't waste it' creation. It didn't turn out exactly as I had planned as I had a bit of an adhesive incident... really sticky adhesive is not always my friend. Nope.. Anyway, I got another black card base ready, covered it with the traitorous adhesive and went to add the negative foil piece but it flapped around a little, got stuck and then I couldn't unstuck it... Ayayay.. it all went pear-shaped. No1: Cover your ENTIRE card base in adhesive! No2: Make sure there are no drafts in the room when adding the foil negative. Maybe even hold your breath. Yeah, do that just to be on the safe side. No3: Start by keeping the foil folded over and smooth it a section at a time. Slow and steady will do it! No4:.... ah, no, there is no no4. Sentiment wise I used another Simon Says Stamp die cut, this one says 'Sending' and I cut it out using black card stock. I also used an Avery Elle die cut that says 'hugs'. It has a shadow die to it too which is something I really like. It just makes the sentiment pop! 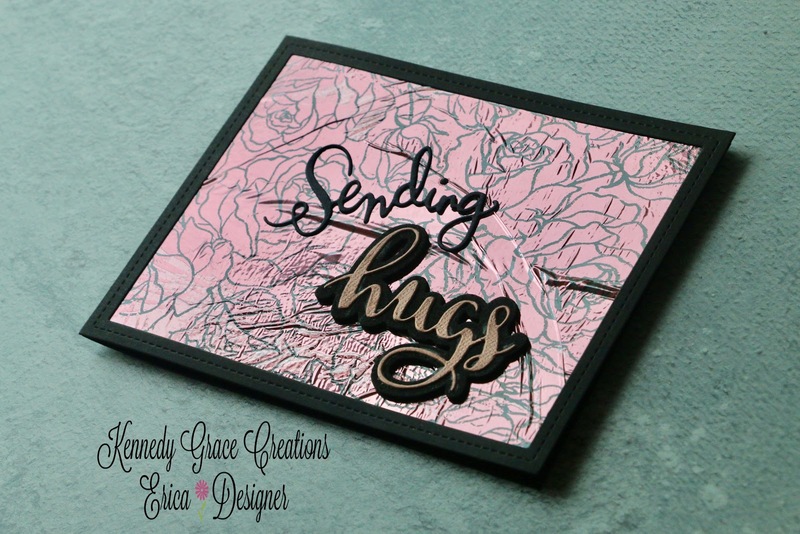 The shadow bit I die cut out of black foam and the 'hugs' bit I cut out of the same metallic rose gold card stock I used for the frame on card no1. As I liked how the stitched frame looked on the other card I cut one out of black card stock and added to this one too and that was it. Two cards made from one piece of stamping, some foil and a little help from little bits and pieces. That's it from me today card wise but I also have a discount code for the Photo Boards® I've used in all the photos in case you want to get one or two for yourself. They really do make taking a good photo of your amazing creations a breeze. I'll have a blog post up later this month about some hints and tips for taking photos as I've been getting lots of questions about the Photo Boards®, props and editing. The code is 'ERICA0617' and the website is Right here, I really can't recommend these boards enough and have a large selection myself.